It’s strike two for the labor department as labor groups unanimously rejected for the second time the new draft rules on endo prepared by senior DOLE officials. 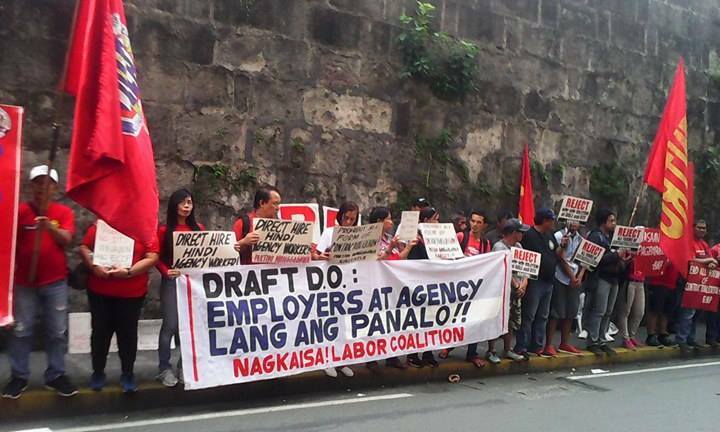 “The draft is worse than the existing DO 18-A,” declared Nagkaisa labor coalition in a letter/comment submitted before the office of Labor Secretary Silvestre Bello III Thursday. Labor groups received the working draft by email from DOLE last week. A picket was also held by members of Nagkaisa against the draft rules which they claimed to be worse than the existing regulations as it subjects almost all jobs and functions to contractual employment and loosen up requirements for registration of labor contractors/agencies. Nagkaisa is fighting for total prohibition of all forms of contractualization that leads to the creation and proliferation of short and fixed-term jobs; establishes trilateral (middleman) employment relations; and the undermining of workers’ rights to security of tenure, freedom of association, and collectively bargain with principal employers. “Sa bagong DO ay employers at agencies lang ang panalo,” lamented Nagkaisa spokesman Renato Magtubo during the picket rally, as the registration of service providers and manpower agencies and cooperatives and the contracting out/outsourcing of almost all kinds of job is made more easy under the new draft. Nagkaisa pointed out that Section 10 of said draft made it impossible to determine if a job is directly related or not to the principal’s main business. As such, there is always the presumption that all jobs can be contracted out. Employers have directly expressed in many forums that they want to continue contracting out any and all jobs as they see fit. “The draft DO progressively strips workers of all legal protection through issues, presumptions and indicators that must be endlessly litigated through an expensive legal system structured to defeat and obstruct labor justice,” claimed Nagkaisa in its comment. The group said the draft DO is neither in accordance nor in compliance with labor demand and the Presidential directive to “end contractualization or stop endo” as it was obviously drawn from the employer’ perspective. “The draft DO is telling workers to make further and greater sacrifice so that the rights of employers and the likes of PALSCON and Asiapro to do sub-contracting and outsourcing business are protected,” added Magtubo. Nagkaisa reiterates its position that new rules on endo must be framed on the regime of prohibition and the institutionalization of bilateral or “direct hiring” employment relationship. Magtubo said prohibition need not be limited to labor-only contracting as compliance to capital requirements, as in the case of PALSCON and Asiapro, should not justify the contracting out of labor to them when the principal employer retains the right to control the means and manner by which the work is done.